Del Weber was UNO's longest-serving chancellor, overseeing significant physical and programatic expansion, including campus housing, the creation of Scott Campus and UNO's first stand-along doctoral degree programs. Update: Visitation will be held on Jan. 16 from 5 to 7 P.M. at Heafey Hoffmann Dworak & Cutler Mortuaries, 7805 West Center Road. Funeral services will be held on Jan. 17 at 11 A.M. at Kountze Memorial Lutheran Church, 2650 Farnam St.
Today, the Maverick family mourns the loss of a visionary leader whose commitment to success forever changed the University of Nebraska at Omaha (UNO). Chancellor Emeritus Del Weber, who served as Chancellor for UNO from 1977 to 1997, passed away on Friday, Jan. 11, following a long bout with cancer. The UNO flag will be lowered in his honor on Monday, Jan. 14. 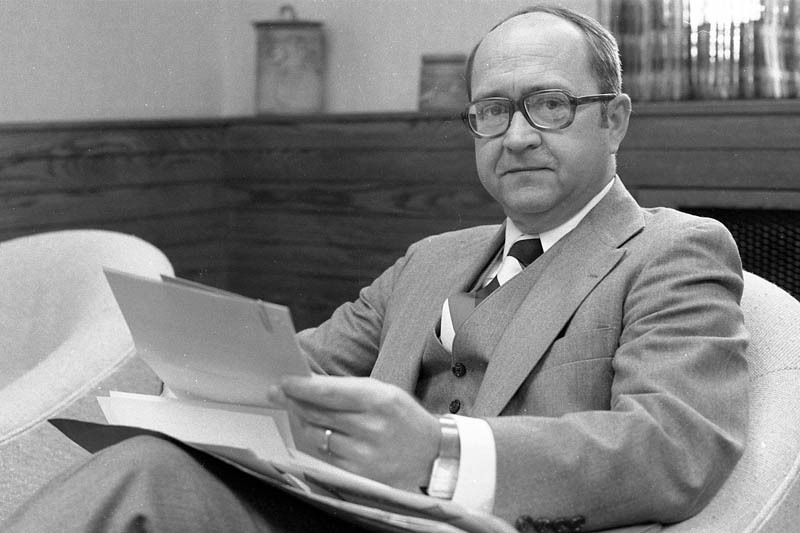 A native of Columbus, Nebraska, Weber stepped into the role of Chancellor in 1977 at just 45 years old. Over the next 20 years, he would oversee a number of important firsts for the campus. In 1985, under his leadership, UNO opened its first parking garage south of the Arts and Sciences Building; in 1993 and 1994, UNO officially launched its first solo doctoral degree programs in Criminal Justice and Public Administration, respectively; in 1996, men's hockey was announced as the university's first sport at the Division I level; and in 1997, just prior to his retirement, Weber received approval to build UNO's first-ever on-campus housing units, which would go on to be called University Village. 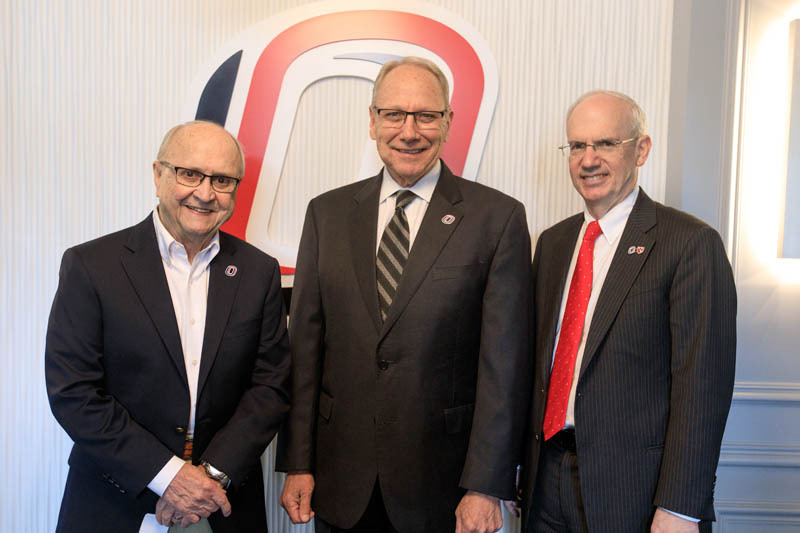 Weber (left) joins Chancellor Emeritus John Christensen (center) and Chancellor Jeffrey P. Gold (right) for a group photo at a recent UNO Alumni Association function. A child of the Great Depression, Weber came from a family where previous generations primarily lived of homesteaders and farmers making their homes in Nebraska. Like many of UNO's students, Weber was the first in his family to attend college and earn a degree, which he did from Midland College (now Midland University), but not without struggle. In addition to his mother taking on work as a cook to help pay tuition he also made a personal agreement with a retired faculty member to help him pay for school with the agreement he would pay it back after graduation. His sacrifices paid off as he earned his bachelor's degree in 1954. Afterwards, Weber spent several years serving as a member of the U.S. Military in counter intelligence. Upon completion of his service, he served as principal of Creston High School in Creston, Nebraska, while earning his master's degree at the University of Nebraska (now the University of Nebraska-Lincoln). While he initially wanted to return to teaching, he was convinced by several faculty members to stay on and earn his doctorate, which he did three years later. Following several teaching and administrative positions between Cleveland State University and Arizona State University, he was alerted to an opening for the chancellor's position at UNO by his mother, who continued to keep him updated on news from the state during his time away. From the first day of his tenure through his last, Weber had a hand in transforming the UNO campus. “The UNO everyone knows today simply would not have been possible without the leadership and vision of Del Weber," UNO Chancellor Emeritus John Christensen, Ed.D. said. Christensen served as a faculty member and dean of the College of Education during Weber's time as chancellor before leading UNO from 2007 through 2017. From his first day as Chancellor through his retirement, Weber sought to expand UNO's role as a premier metropolitan university. 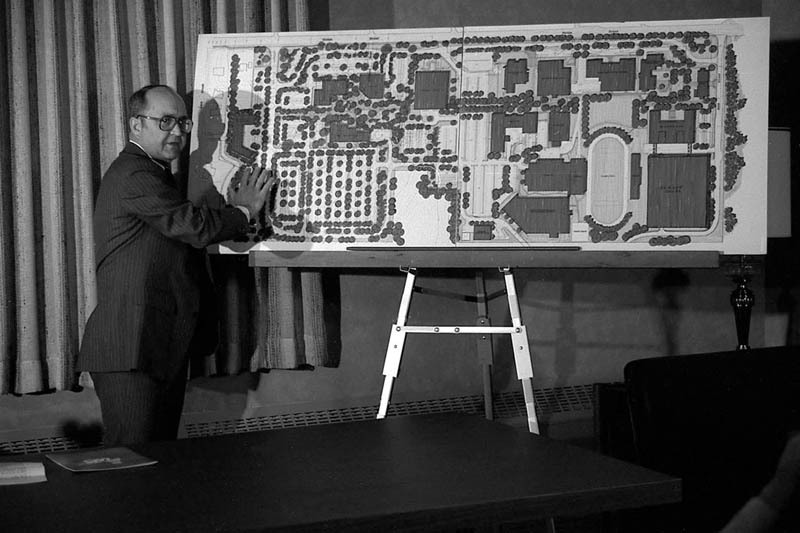 When Weber arrived in the summer of 1977, UNO had just completed construction on the Dr. C.C. and Mabel L. Criss Library at the western-most edge of campus. Beyond the library was a collection of homes that Weber would spend the next 10 years working with the city and community members to purchase as part of a much-needed expansion. During his tenure, this land would eventually become home to key facilities like the Durham Science Center, Weber Fine Arts Building (named for Del Weber and his life Lou Ann) and the Thompson Alumni Center. Several of the homes purchased in the deal still stand, today, including the UNO's Child Care Center and Hayden House, which is home to UNO's Division of Student Success. Expansion was also on Weber's mind during his final months as chancellor. Thanks to an agreement with First Data, UNO received an additional 70 acres of land south of Pacific Street in 1997. As part of this agreement, Weber built a coalition of supporters to make the case for UNO's first new college in decades, the College of Information Science and Technology. The newly formed college would share space on the newly-acquired land with the UNL College of Engineering at the Peter Kiewit Institute. Beyond the physical expansion of campus, Weber also improved UNO's standing as a higher education institution. In addition to overseeing the addition of the campus' first doctoral programs, Weber also oversaw the doubling of full-time and doctoral-level faculty at UNO. Other major milestones included the first visit to campus by a U.S. president when Gerald Ford visited in 1977, the establishment of UNO's first sister-university agreement with Shizouka University in Japan in 1979, the construction of the iconic Henningson Memorial Campanile in 1989, the creation of the Aviation Institute in 1990 and two national championships at the Division II level for the Mavericks. Weber was also fiercely committed to Nebraska and to the city of Omaha, both during his time as chancellor and following his retirement. He led Omaha's United Way Campaign in 1983, was crowned the 93rd King of Ak-Sar-Ben in 1989, was named "Man of the Year" by the Omaha Club in 1992, served 17 years on the OPPD Board of Directors following his retirement, was president of the Omaha Community Foundation from 1997 to 2002 and also served on the boards of the Greater Omaha Chamber of Commerce and Salvation Army. He was also a dedicated family man, marrying his high school sweetheart Lou Ann in 1954, with whom he celebrated 64 years of marriage and had a son, Bill, and two daughters, Beth and Kelly, as well as 11 grandchildren. 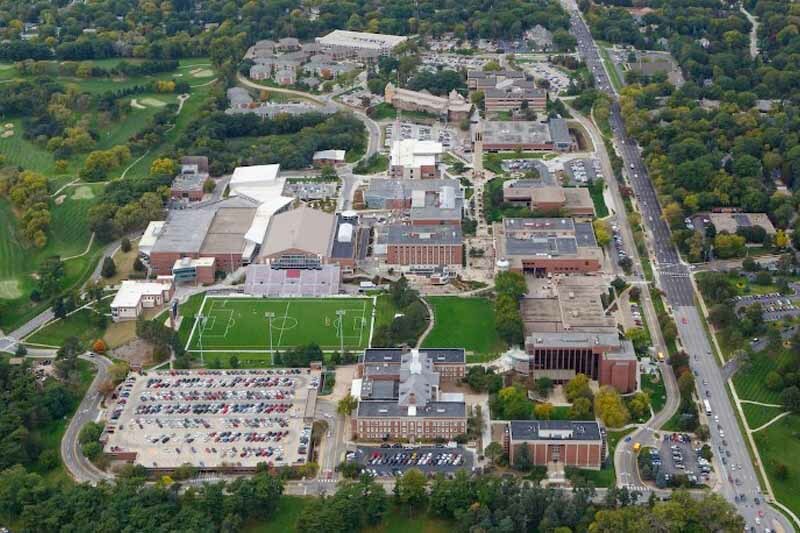 Over 20 years, Weber helped add more than 100 acres of land to the UNO campus, including the addition of iconic buildings such as the Henningson Memorial Campanile, Durham Science Center, University Village and the Weber Fine Arts Building, named in honor of him and his wife, Lou Ann. Weber will also be fondly remembered for the relationships he built. Whether it was leading a critical meeting on campus or joining members of the faculty and staff for a game of bowling down the street from UNO, his ability to create and nurture strong relationships has impacted each and every person he met as Chancellor. As the UNO community mourns the passing of Chancellor Emeritus Del Weber, it is also an opportunity to celebrate accomplishments, service and lasting impact, embodying all that it means to be a Maverick.